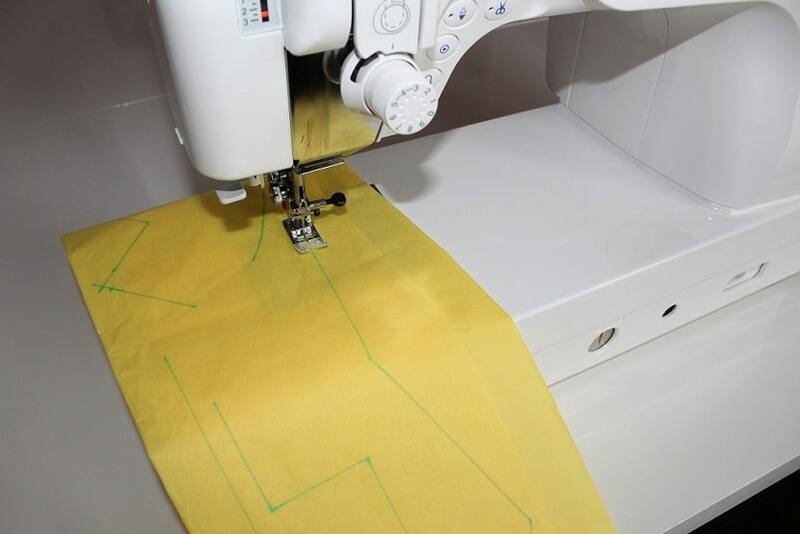 In this tutorial I will show you how to start working with a sewing machine. When I got my first computerized sewing machine, I was very excited and enthusiastic for a few minutes until I realized that I have no idea how to use it. So many controls and buttons! I certainly couldn’t operate it without learning first. So, I started to study the manual. I noticed pretty soon that it is not as complicated to learn as it might seem. Machines make sewing fast and easy but learning to use them will take some time. 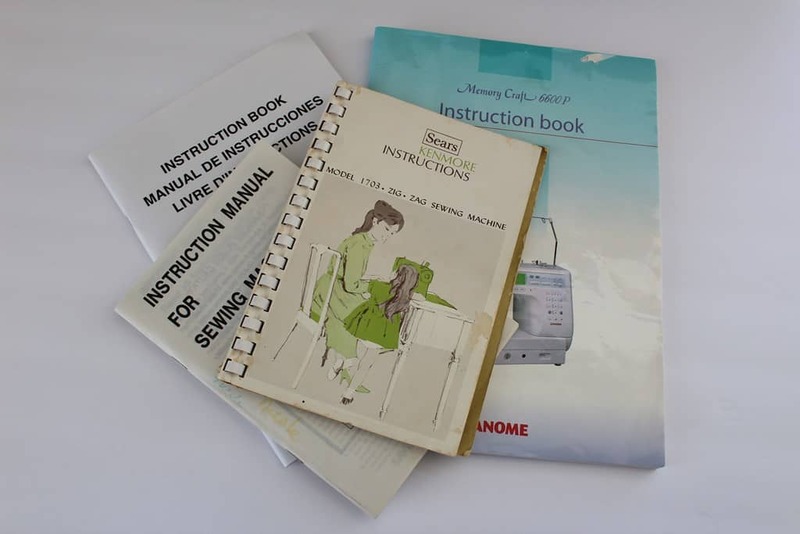 If you use an old sewing machine it may be a problem to find the manual for it at home. Look online for your brand and model. In most cases, you will find it on eBay. Usually people only read the manual as a last resort. Remember the phrase: “When all else fails read the manual”. But it often means the difference between a capable and confident user who gets the most out of the sewing machine, and one who is wary, hesitant, and limited. Be prepared though that manuals are usually very technical, often hard to follow and tend to bury the necessary information among collections of safety warnings. So, when you open your manual, you will usually see first something like this: READ ALL INSTRUCTIONS BEFORE USING THIS APPLIANCE. But I bet, you have already turned it on and fiddled with the buttons. And now you have a question in your head: What, I need to read this a 100 pages paper book instead of going to my phone screen? Well, I hope you can work it out and it will be not too hard to find what you need to know in the beginning. Treat your manual as a cookbook – find “the recipe” you need at this point and ignore the rest till next time. Each brand of sewing machines has its own design and specifications. 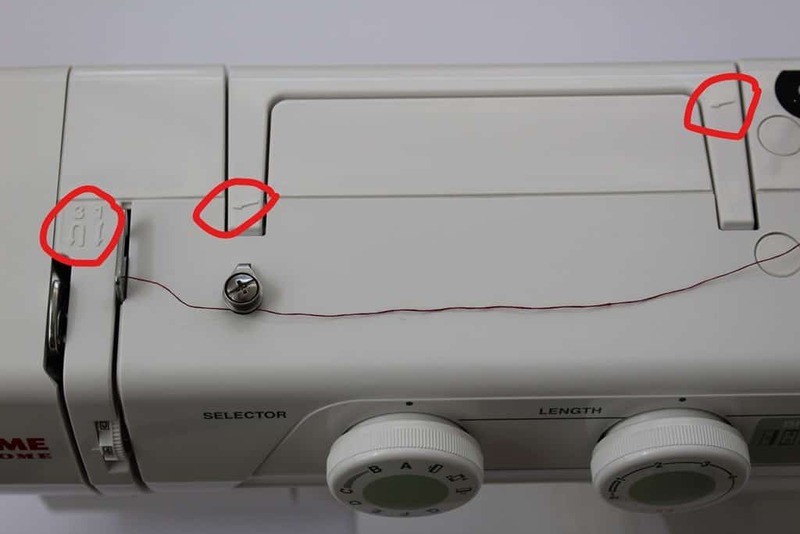 That’s why I can’t give you an exact guide about function buttons of your model, about threading your machine, winding the bobbin, balancing thread tension, selecting the sewing mode and other specific machine settings. These details you will find in your manual. And my task is to guide you so you are not burdened with all the information and can start using your machine right away. As any device, sewing machines have specific parts, named with characteristic terms. 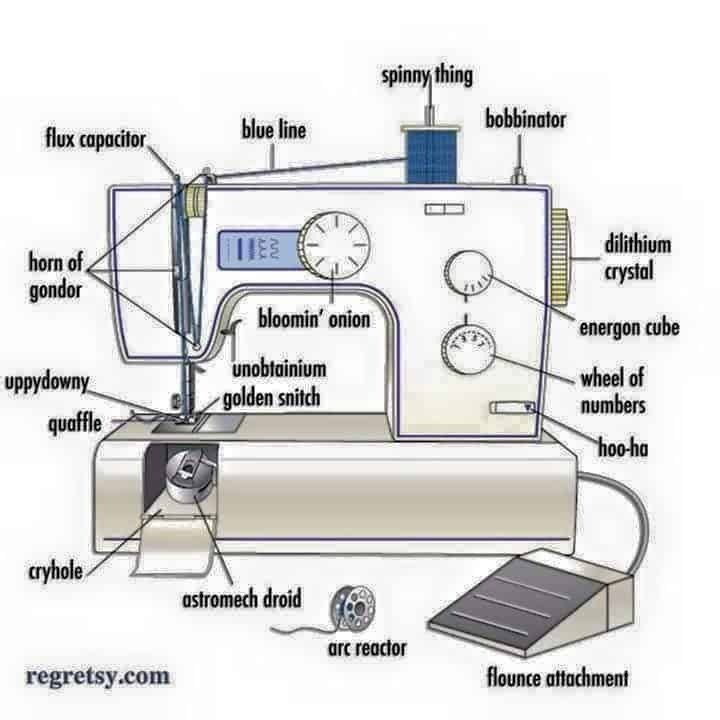 If you want to sew you will have to learn and use many sewing terms. You need to know at least some of your sewing machine parts and control nobs. 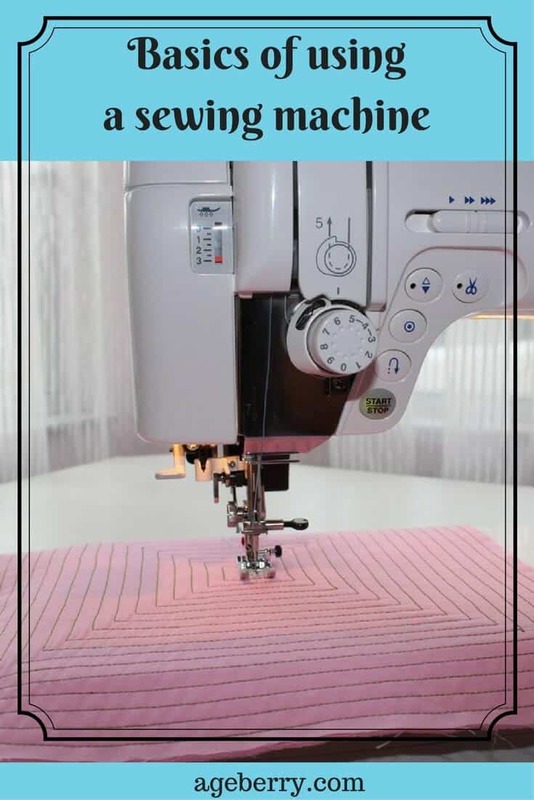 The point is that if you develop good sewing habits from the start and learn about how a sewing machine works, you will be able to do your own troubleshooting when you start having trouble. There are hundreds of models and brands on the market but even if all machines are not made equal and they don’t have the same parts and performance, their basic functions are the same: they connect pieces of fabric together with automated stitching mechanism, they require a continuous thread that runs from a spool pin on the top of the machine to be fed to the needle and this thread has to be connected with another thread from the bobbin. The bobbin is just a small circular spool of thread located in a shuttle underneath the needle. The needle is fastened by a screw to the needle bar, which is driven up and down by the motor. The fabric, placed on a metal needle plate under the needle, is held down by a presser foot which is held by a presser bar. The pressure can be adjusted for different weights of fabric. Presser foot lifter raises and lowers the presser foot. There is the feed dogs mechanism which pulls the fabric forward every time the needle is pulled out of the fabric. The thread runs through the tightening arm and through a tension disc assembly. By turning the disc assembly, the sewer can tighten or loosen the thread going into the needle. 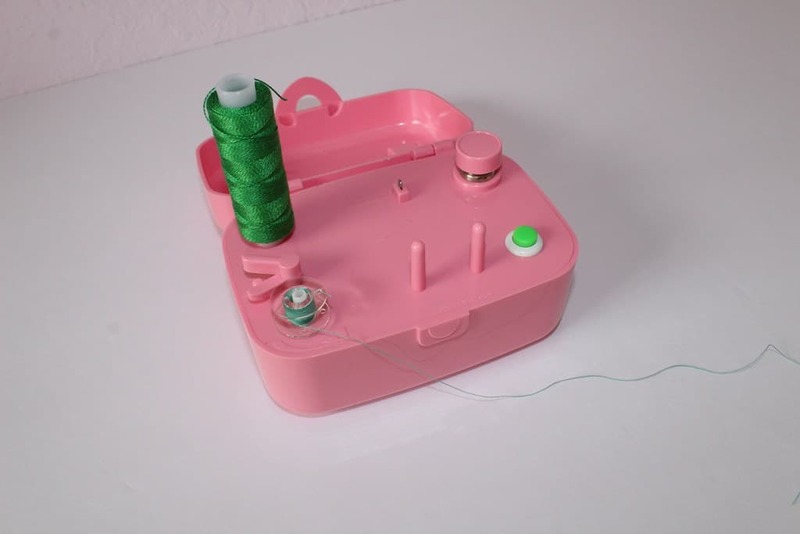 All sewing machines also have bobbin winders to fill bobbins with thread and hand wheels which move the needle. All machines produce a straight stitch – a simple stitch that binds fabric with a straight seam. Other parts and functions differ from machine to machine. For example, some of them have electric foot controls and some of them work with just a small start/stop button. Most modern home sewing machines are computerized and they can sew hundreds of different stitches. They have built-in computers, as well as visual displays for easier operation. Most controls are done by touching a button! Are you getting bored studying your manual? Let me try to give you something to laugh about. I hope it will make you smile and get you in a humorous state of mind. It seems that to make a straight line with a sewing machine is the easiest task. But it is not as simple as it seems. Your hands are not used to hold the fabric properly, and the fabric wriggles, slides and stretches under the needle. And in the end your stitches which are supposed to be straight look crooked and distorted. It is easier to learn how to sew exactly along the lines if you first start to sew on paper just with a needle without any thread. When you get even lines on paper, it will be much easier for you to cope with the fabric. So, take some wrap tissue, fold it, and draw straight lines on it with a marker, something like on this photo. Now put this paper under a presser foot of your machine and start sewing along the lines. Try alter the stitch length with Stitch length adjusting button. Try to control sewing speed on your machine. 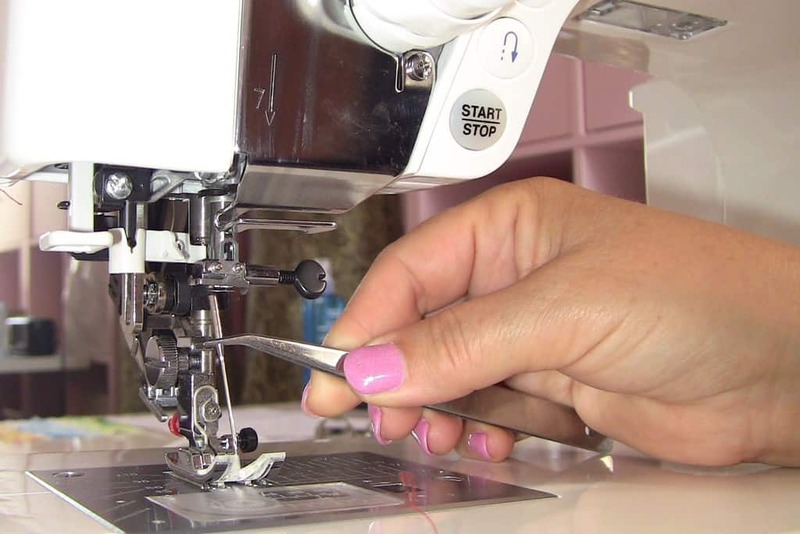 When you need to change sewing direction, stop the machine with the needle lowered down into the paper, raise the presser foot, turn the paper around the needle, lower the foot and continue sewing. After sewing on paper your needle will become blunt. So you will need to change the needle before doing any sewing on fabric. For this you will usually need to loosen the screw that holds the needle and take it out. When inserting a new needle make sure that the flat side of the needle goes to the rear. Tighten the needle screw firmly. Never use a blunt needle. The needle size has to match the thickness of the fabric and the thread you use for your project. Check whether the needle passes without obstacles through the hole of the needle plate, whether the needle is sharp, whether it is bent or even broken. For this tutorial we will use universal needles size 80/12 and 90/14. Each sewing machine is a little different but the principle is the same – the thread has to go through few eyelets and a tension disk before it goes to the needle. The sequence of draws is very important and can be found in your manual. You can’t ignore the order, or you may end up with a broken thread, needle or even the whole machine. 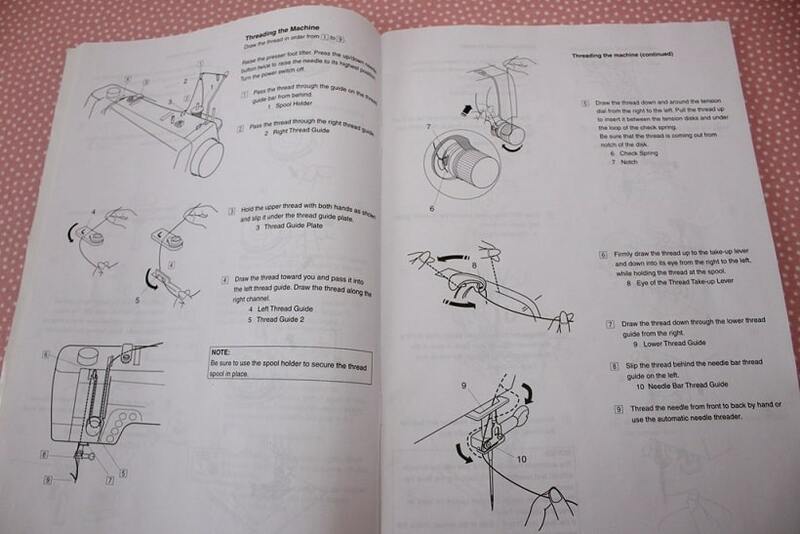 For example, the manual for my sewing machine has very detailed instructions about threading the machine. Many new machines have lines and arrows designed to help you to do threading correctly. So look at your machine. Do you see a diagram printed on the machine itself? Presser food lifter must be raised and the needle has to be in its highest position before the threading procedure. Place the thread on a spool pin and draw the thread through the upper thread guide – a metal part sticking out at the top. The thread must go down through the tension disk and return up to the second thread guide. Thus, the thread will pass the path in the form of a letter U. After this it must go through the second thread guide at the top and drawn down to the needle. 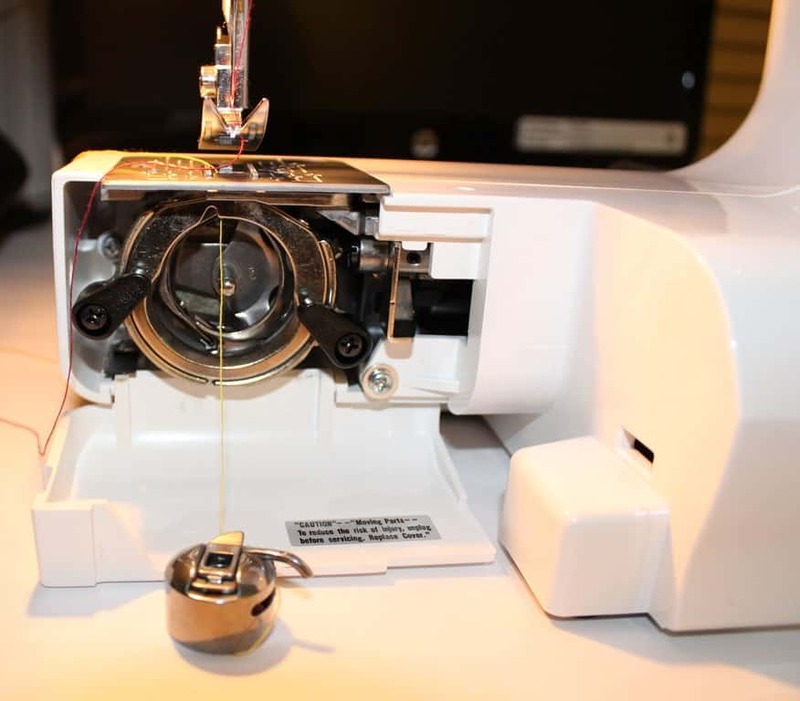 Insert the thread into the small hole at the bottom of the needle from front to back by hand or use automatic needle threader if your sewing machine has one. Then the thread must be drawn under the presser foot, located directly under the needle. VERY IMPORTANT: the power switch should be off. Otherwise you may be injured if you accidentally press the pedal or push the start button when your fingers are under the needle. It’s very important to use the same type and size of thread you put in the needle. For sewing projects they have to be the same color. But for test sewing we choose different colors of threads so you can see better how threads connect with each other in stitches. 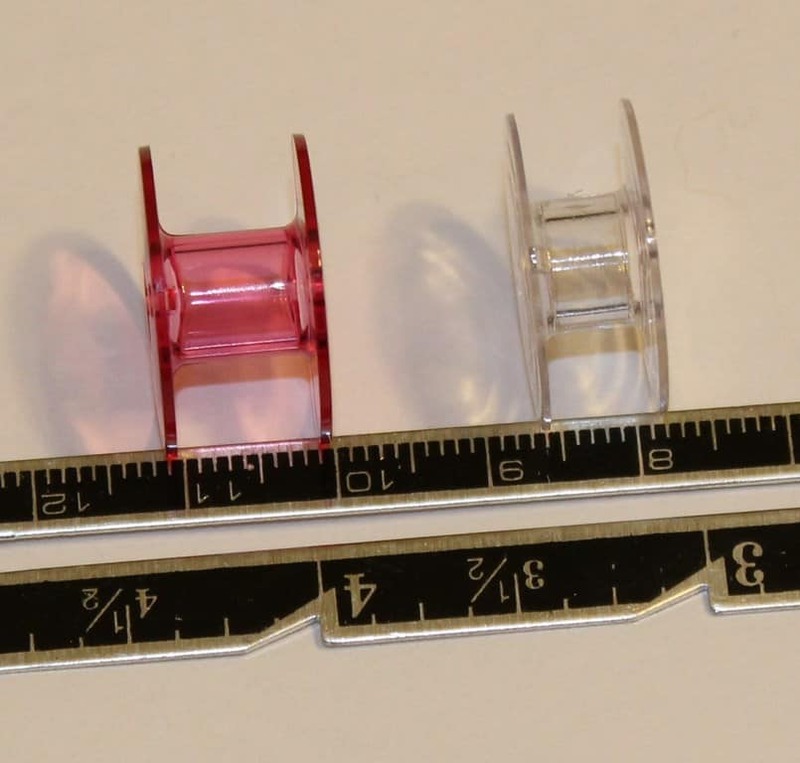 Have in mind that bobbins vary in size on different machines. So if you need to buy new bobbins for your projects choose exactly the same size bobbin you have inside your machine. They can be plastic and metal. Draw the thread from the spool through the bobbin winder tension disk. Pull the thread through the hole in the bobbin. Place the bobbin onto the bobbin winder pin and lock the latch against the bobbin until it clicks. Start the machine. Wind the thread until the latch releases, and remove the bobbin. Bobbin winding should be balanced. If your machine is doing it incorrectly, hold the thread with your hand and manually direct it onto the bobbin. On older and simpler machines bobbins usually fit in a metal bobbin case but in most modern machines bobbins are just put under the needle plate right in the shuttle without any case. If somehow the winding mechanism is broken on your machine or you do not want to use an expensive piece of equipment for such a simple task you can buy a special bobbin winder. It look like this. 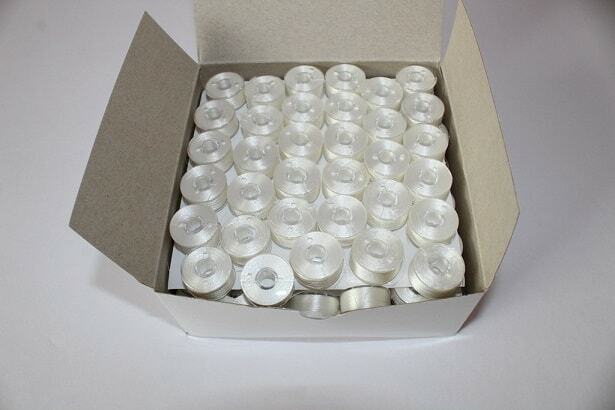 Or you can buy pre-wound bobbins. But make sure the sizes of bobbins and threads are proper. Place the bobbin in the bobbin holder according to your manual’s instructions. For sewing you need to bring the bobbin thread up from the underneath of the needle plate. For this raise the presser bar lifter and while holding the needle thread with your finger, move the needle down and then up to bring up the bobbin thread. Slide 4 in (10 cm) of both threads to the back under the presser foot. Place 2 pieces of cotton fabric under the presser foot with the bulk of the material to the left of the needle (use size 90/14). Lower the needle into fabric about ½ in from the beginning of seam by turning the balance wheel manually (always turn it toward you). Pull needle and bobbin threads toward the rear. Lower the presser foot. Stitch 3-5 stitches in reverse to secure the thread’s ends. Complete the seam. When you reach the point you wish to stop, sew back in reverse 3-5 stitches again to fasten the seam. Do not stitch beyond the edge of the fabric. Cut off threads at each end of the stitching. Try to run the machine at different speed settings. Always finish sewing with the needle at its highest point. Guide the fabric gently with your hand in front of the needle letting the fabric feed naturally. Never pull the fabric. Before and after stitching press the fabric so stitches are perfectly flat and smooth. It can be so annoying when you need to stitch something and the machine does not sew correctly, breaks the needle, tears the thread, tightens the fabric. But it doesn’t mean that you have to rush to a service center to repair it. The most common problem is the incorrectly adjusted thread tension. Usually it is simple to make such adjustment, but it is important to have at hand a manual and some patience. Even the most expensive and high-quality sewing machine requires additional adjustments for different fabrics. In books they say that the correct straight stitch has threads locked between two layers of fabric. Picture A below. But in reality, it is not always true. It goes only for medium weight and heavyweight fabric, and if the fabric is lightweight it may be too thin for stitches stay between the connecting layers. Actual connection of upper and lower threads on the thin fabric can be seen on the side of the bobbin thread but the stitches are still correct. But if we have puckering of the fabric on either side then we have a problem that should be fixed. Now look at the stitch you made. Do you see the needle thread on the bottom side of the fabric and the fabric is puckering on the bottom side? Then tighten the needle thread tension by moving the disk to a higher number. Do you see the loops of bobbin thread on the top side of the fabric and the fabric is slightly puckering on the top side? In this case you will need to loosen the needle thread tension by moving the tension disk to a lower number. But puckering can happen also when the foot pressure is not right for the fabric. Find in your manual if you can adjust the foot pressure. Not all machines are equipped with this control but if you have it, then it has to be stronger for thicker fabric than for fine lightweight and elastic fabrics. 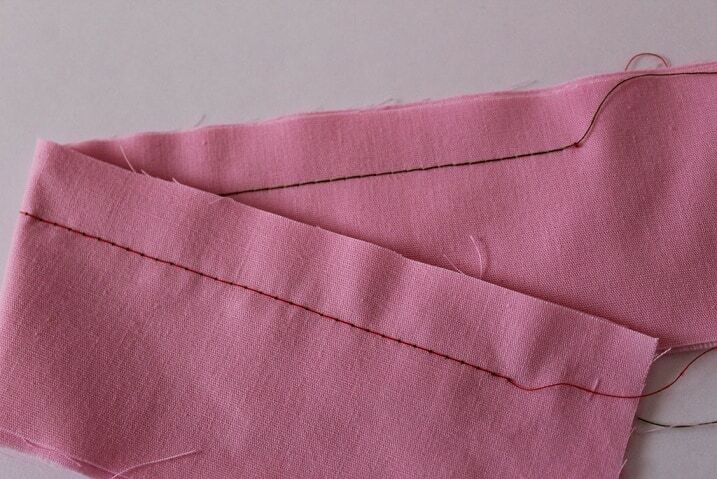 Also for correct straight stitch you have to choose proper size of thread and needle. Sometimes it takes a lot of time to adjust the machine setting, especially on “whimsical” fabrics: fleecy, stretching, very thin and slippery. Be patient and don’t leave the settings as is. 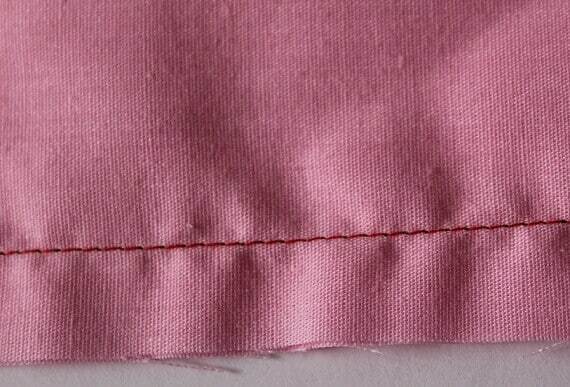 Any sewing machine is able to make the stitches perfect. You just need to adjust it properly. 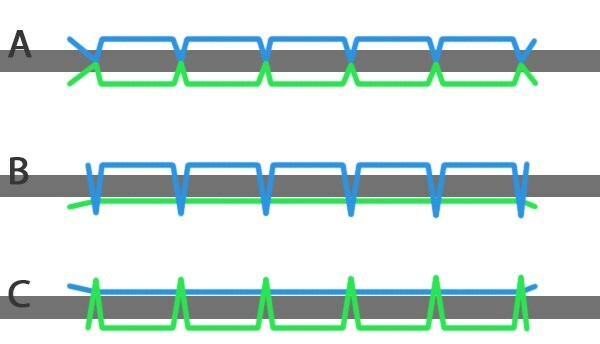 Straight stitch can have variable length. It can be altered by moving the stitch length adjusting knob. For thin fabric it is smaller, for thicker fabric it is bigger. Standard length is usually between 2 and 3 mm. For thin fabric it should be around 2 mm, for thick fabric – at least 3 mm. Now, after we used cotton fabric, let’s try to sew fine silk and thick wool. First sew them without any changes. Do you see any difference in quality of stitches? Any broken threads or needles? Skipped stitches? Seam puckering? If you see some problems ( you should see them for sure) change the needle (for fine silk it should be thinner, 80/12 or even 70/10 and for thick coat wool it may be bigger, 100/16), adjust the thread tension and sew again till you are satisfied. Usually before sewing with the machine you need to baste pattern pieces by hand with running stitches to hold them together while you finish sewing them with permanent stitches. You have to stitch with the machine at a distance of 1mm from basting line (about 1/32 inch, it means very close to it). But try to not step with the machine on the basting thread as it will be difficult to take off temporary hand stitches. Some professionals recommend to baste pieces of fabric just with sewing pins without any running stitches. In this case pins must be perpendicular to the sewing line (or to the seams). 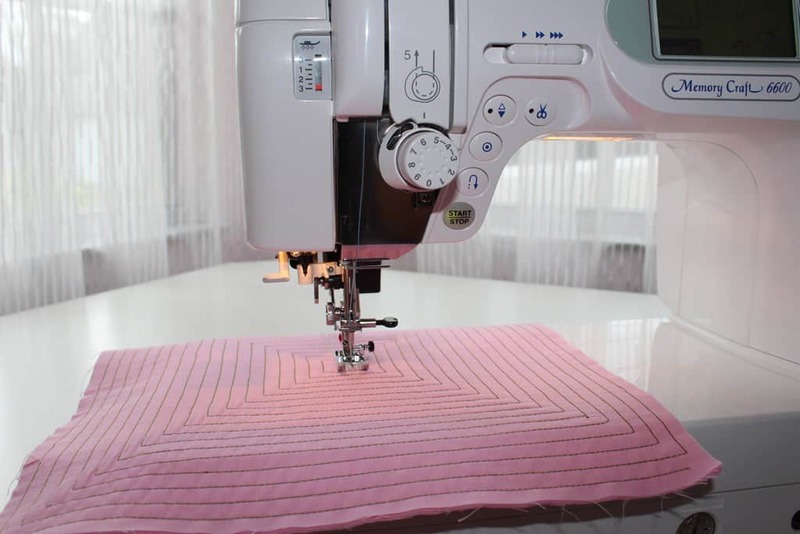 Put your machine in a comfortable bright place and take care of an additional light source if you will be sewing with artificial lighting in the evening. Clean your machine. 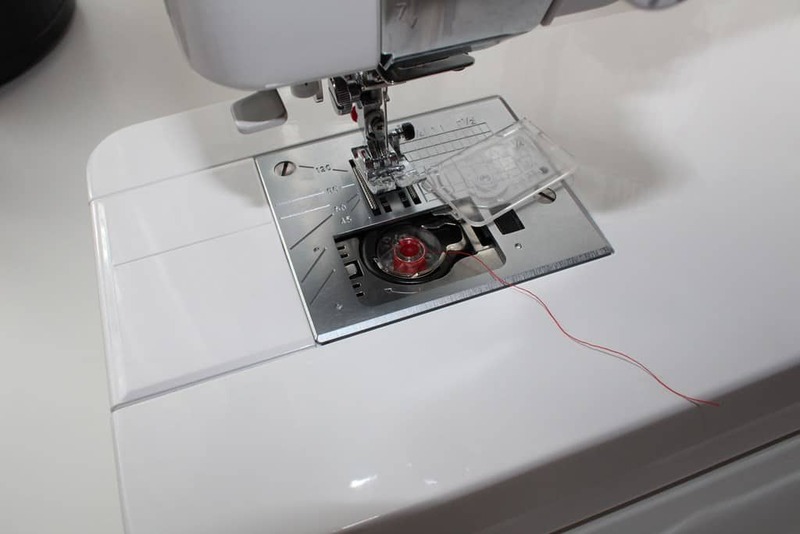 After you finish sewing, wipe the machine, clean the bobbin case and remove the dust that has accumulated inside the shuttle, place a piece of cloth under the foot, lower the needle and close the machine with the cover. Very often the finishing line has to be fixed with two or three hand stitches or the end of the upper finishing thread may be removed to the wrong side and tied by hand. Zigzag stitching is widely used to prevent fabric from fraying at raw edges. It is a very strong stitch that holds fabric together extra tight. It is hard to rip. 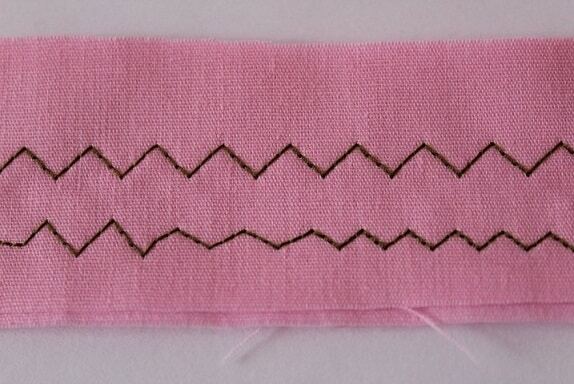 A dense zigzag stitch can also be used for appliques. 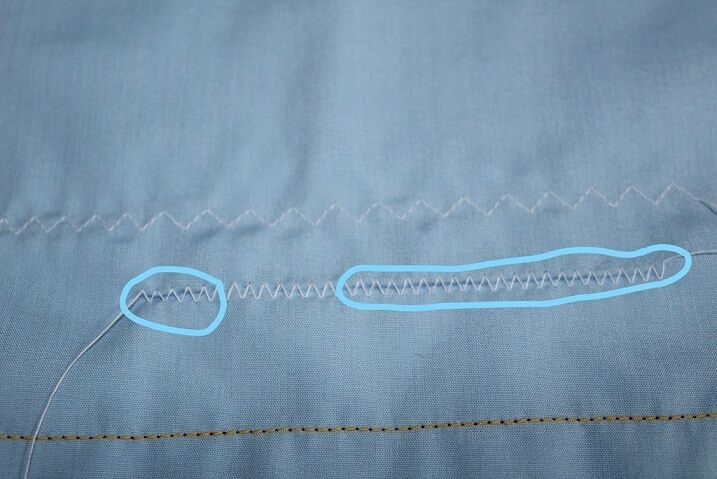 Set your machine to zigzag stitching using your manual. 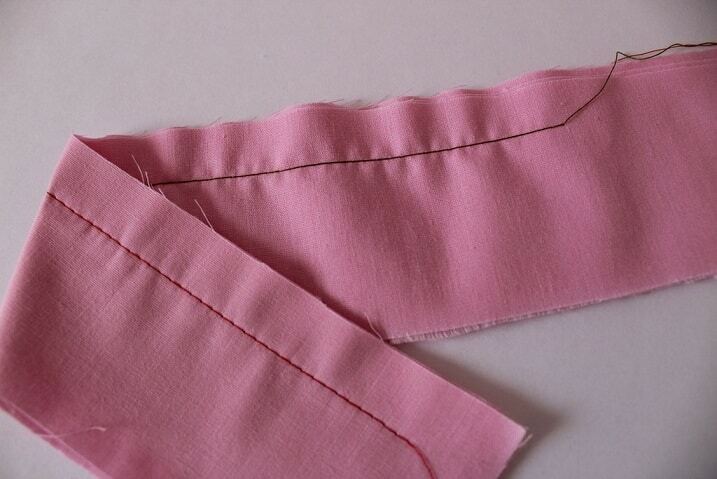 Sew few stitches and try to change zigzag length and width. 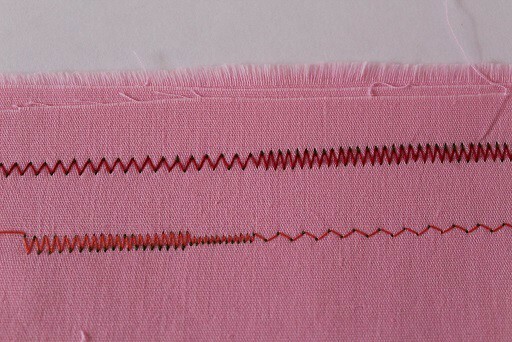 Correct tension of zigzag stitch is when the bobbin thread doesn’t show on the top side of the fabric and the needle thread shows slightly on the bottom side of the fabric. Sometimes when you sew zigzag you may have a problem with the fabric puckering under the stitches. It can happen because of the width of zigzag stitch is too big for the fabric you use. So lower the length and try to sew again. If the problem didn’t disappear set your machine to the different zigzag stitch which called multiple zigzag or tricot stitch. It looks like zigzag but with dashed line and with three stitches per “zig”. I would advise you to make some very useful “exercises”. Prepare 4 square pieces of medium weight cotton, 30 cm x 30 cm (12 in x 12 in). Baste every 2 pieces with a running stitch on all 4 sides. 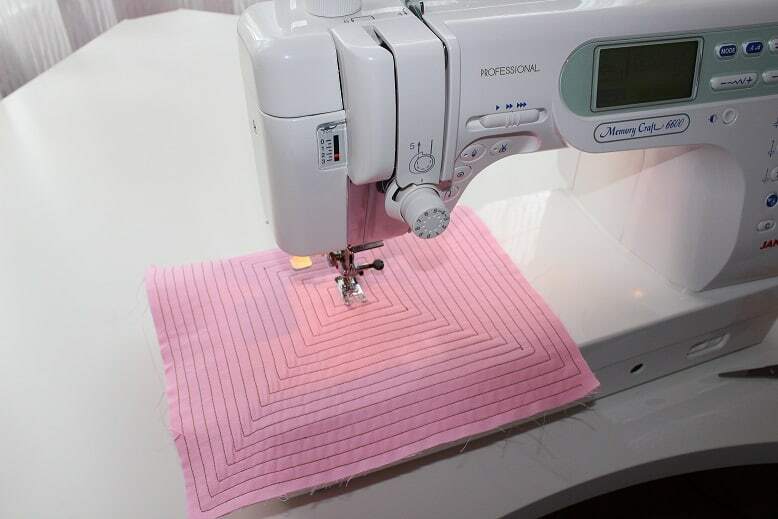 Start sewing a square labyrinth in one of outside corners, keeping 0.75 cm ( about ¼ inch ) distance from the seam edge which is equal the half width of the presser foot of your machine. The right edge of your presser foot should be level with the fabric edge. And focus on keeping the same distance between all rows of stitches. Choose the stitch length 3 mm ( 1/8 inch ). Sew at lower speed and don’t rush through it. Your main problem will be stopping in the corners at the point which has the same distance to both stitching lines. When you reach the center through countless turns your sewing skills will be significantly improved. After you complete this project sew a labyrinth in the circle on the other piece of cotton. Keep the same settings. Draw a small circle in the middle with some marker and start sewing along the line. In this case your main problem will be correct maneuvering of the fabric under the presser foot. Now you know basic sewing machine stitches. I advise you to practice more. You will be surprised at how non-intimidating this stuff is once you just start to do it more often. And eventually these practices become habits that you don’t even think about – you just do them automatically. Did you practice? How hard was it? Do you have any questions? Please, include images of your labyrinths in your comments. OMG, thank heavens for your site! I love your step-by-step (and sew on paper/no thread) plan! So now that I am retired, I WILL do this! LOL. Wish me luck. Oh, Theresa, I wish you good luck with sewing. Thanks for stopping by and telling me about yourself. 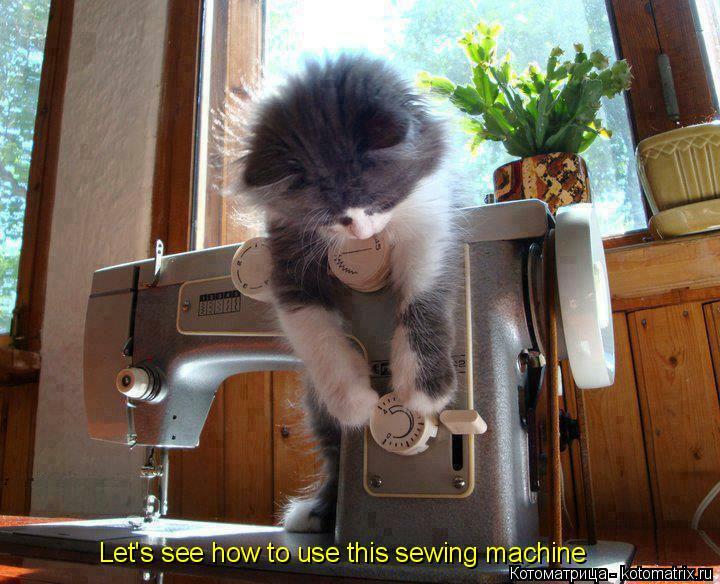 I am sure you will master the sewing machine in no time at all. I see many people start sewing after retirement. It’s often no time for crafting when we have full-time jobs. If you have any questions don’t hesitate to send me a message to olga@ageberry.com. I am always happy to help. Do you know already what will be your first sewing project? It is an interesting idea to practice sewing with your machine without thread when you first get started. I want to be able to sew costumes and quilts for my kids, so I am thinking about buying my first sewing machine. Since I’ve never used one before, I will try your exercises out. Before I switch to fabric, I’ll remember what you said about using a new needle.